This award winning song and story series will fill your home with fun-filled praise to the Lord. Each CD provides wholesome messages that are sure to last a lifetime. A delightful production that kids will love while learning valuable lessons! Get your toes tapping and your hands clapping to this wonderful musical about the friendship of God. 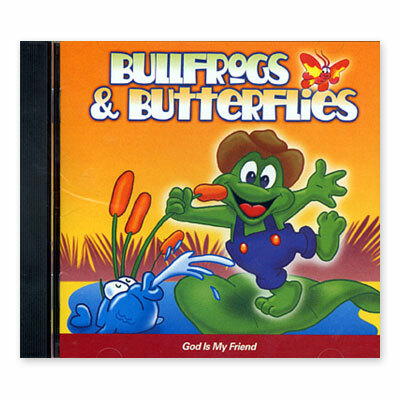 Your child will love listening to this Agapeland Bullfrogs and Butterflies CD over and over again...and you will too! This is the first CD in the Bullfrogs and Butterflies four CD set. The track listing is: "Welcome to Agapeland," "Good Morning," "This Is The Day," "Narrarator," "Rainy Day Song," "Kid Talk," "I Like Knowing God The Best," "My Hands Belong To You," "Friends," "Practice Makes Perfect," "Bullfrogs and Butterflies," "Noah," "You're So Good to Me." Printed lyrics are also included with the CD. Designed for children ages 2-10, this highly entertaining and cleverly written recording comes from the talented producers of the best selling Christian music series, Music Machine. This entertaining, music CD is ideal for trips in the car or homeschool use, so take a break from your day and listen to this positive, Christian CD! Your child will love singing fun songs while learning about the Lord! So don't wait! Create long-lasting memories with your child. Order God is My Friend from Alpha Omega Publications today! Your child will be glad you did.